The Union Cabinet today approved an amendment, which aims at weakening the Right to Information Act, by debarring the notings of bureaucrats from the citizen’s domain. India today evacuated 300 of its nationals from Lebanon even as the number of those of the 12,000 Indians in the war-torn country wishing to leave the country is on the increase. 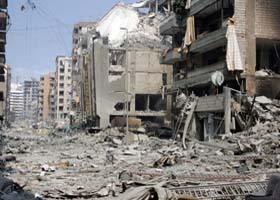 Buildings destroyed by Israeli air strikes stand among the debris in southern Beirut on Thursday. Is the government doing enough to help Indians in Lebanon? Pakistan President Pervez Musharraf tonight asked India to provide evidence of Islamabad’s alleged involvement in last week’s Mumbai bomb blasts and criticised New Delhi for threatening to stop the peace process. 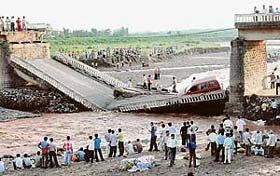 Four persons drowned and three vehicles were washed away after a bridge on the Kala Amb-Shahbad state highway collapsed this afternoon. A view of the bridge at Kala Amb in Himachal Pradesh on the Sahabad- Markanda road which collapsed on Thursday. While action against civilians involved in the sensational Tehelka expose, which rocked the nation over five years ago continues to move at a snail’s pace, the Army has brought its share of disciplinary proceedings to an end, with Chief of the Army Staff confirming the sentence awarded by a court martial to Brig Iqbal Singh. Former Foreign Minister Jaswant Singh has alleged that someone in the PMO during P.V. Narasimha Rao-led Congress government had been leaking nuclear secrets to the US and “we are still being snooped”. Security agencies have launched a probe to trace the origin of the an email sent to President A.P.J. Abdul Kalam. It contained a threat to his life. Sachin Tendulkar today returned to India’s one-day squad after a long injury layoff, while Dinesh Mongia earned a surprise recall for the upcoming tri-series in Sri Lanka. The Vice-President of India and Chancellor of Panjab University Bhairon Singh Shekhawat today approved the name of Prof R.C. Sobti to be the next Vice-Chancellor of the Panjab University. A communication to this effect was received at the PU VC office here this evening.